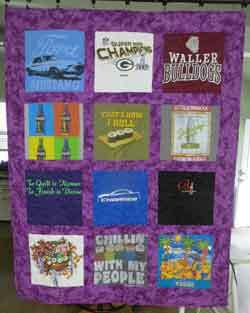 You always wanted to have a T-Shirt Quilt. You begged your friends that do a bit of sewing. You begged your grandma. You tried to bribe your mom. So, you decided to do it yourself You started whacking at the t-shirts. Thought you could make a creative quilt. At some point you figured out that was not a good idea. Finally, after years of sitting undone, you decide that it is time to call in a professional. We get several quilts each month where someone has started, their grandmother started or a friend started the quilt top, and find themselves stalled at completing the top or to complete the quilting. No worries, so far, we have been able to handle everything that that has been presented to us. The quilt to the right was an easy fix. The customer had pieced the top together, but there weren't any borders. she had lots of the purple fabric left over. We were able to create a wide border that gives the quilt a completed look. Quilted it up and she was pleased with the results. 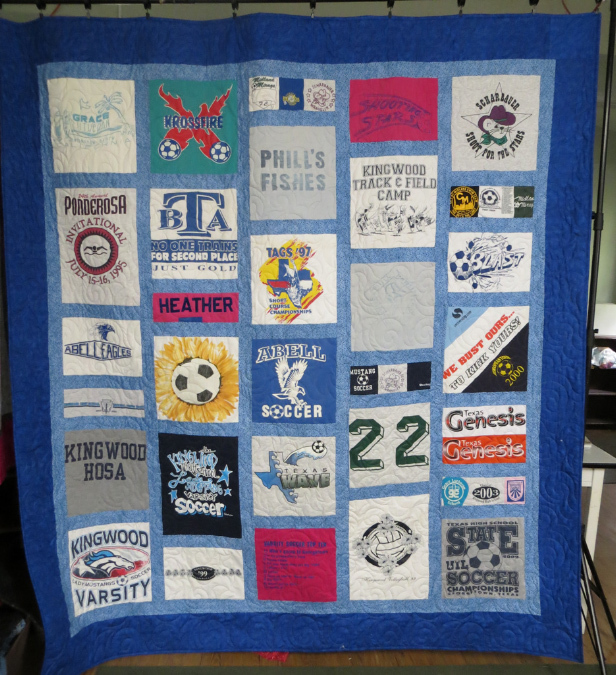 This quilt came to me in a wide variety of pre-cut t-shirt pieces. There was no rhyme or reason to the size. The pieces looked like they had been hacked with garden shears. While the quilt ended up being quite the success, the quilt was actually assembled in 'columns' rather than a totally random layout. See more on Order vs. Chaos! The smaller pieces were actually placed in their own column rather than adding fabric around each t-shirt. If you look really close columns two and three are actually narrower than the other columns. Sashing was placed around each shirt so that the t-shirts all go together. Without the sashing, the quilt just ends up being a mish-mash chaos of shirts and color.